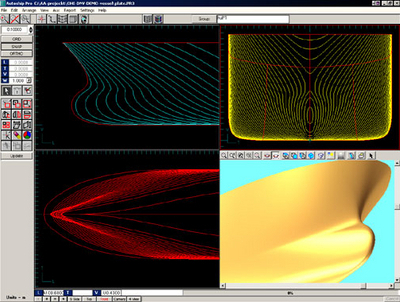 Autoship hull design/surface modeling program combines the graphical user interface of Windows with the dexterity of NURBS (Non-Uniform Rational B-Spline) mathematics, the high-end CAD standard for surface modeling. Autoship enables you to create any hull shape from a racing yacht to a super tanker quickly and efficiently. The user-friendly interface enables the designer to work either in 4 views simultaneously (profile, plan, body and rotatable 3-D) or one of the views singly merely at the click of a button. The 4 views may be dynamically resized at any time and may be individually panned. There are 10 levels of zoom/unzoom. Also featured are 10 levels of undo/redo to trace and retrace design steps. And you can specify multiple light sources and generate realistic, Z-buffer renderings with smooth shading. Autoship's building blocks consist of Points, Curves, Surfaces, Polyobjects and Groups. Groups are collections of objects, including other groups, which may be scaled, rotated, mirrored, offset, and multiply instanced to allow very complex structures from a minimal number of objects. Changes to an object are propagated through the groups containing it. Points may be free in space or embedded on a curve or surface. Curves may be free, embedded on another curve or surface or projected on to a surface, and the curves ends may be attached to points. Curves may be free or embedded on surfaces or other curves. There are several methods available to create a curve: specifying endpoints, sketching, forming an arc or rectangle, projection onto a surface, lofting through points, by intersecting surfaces, as offset from another curve, as foil shape, as row or column of a surface or by geodesic offset from another embedded curve. Surface edges may be attached to a curve or another surface. Create by specifying dimensions, by rotating a curve about an axis, by extruding a curve along a vector, by sweeping one curve along another, by ruling between two curves, by multi-conic development (developable surface) between two curves, by offset from another surface, by blending between surfaces, by skinning through a set of curves or by joining two surfaces. Displays the tree structure of a project and gives quick access to object properties and operations. There are curvature displays for both curves and surfaces. A "porcupine quill" display is available for both curves and surfaces, and a color-mapped rendering shows mean curvature or gaussian curvature of a surface. The user can specify a tolerance for output and curves and surfaces are automatically refined to meet or exceed that tolerance. This enables the user to choose high accuracy for NC cutting or to specify a larger tolerance value during design to save on computation. Models may be exported and imported in 2D or 3D via industry-standard DXF and IGES file formats. A 4 view DXF will output a complete lines plan. Autoship comes with built-in Quick Hydrostatics, with equilibrium calculation, plus fast links to Autohydro for full hydrostatic analyses and to Autopower for resistance and powering prediction. Hardware Required: For optimum performance we recommend a fast Pentium with 132Mb of RAM, 40Mb free disk space, 8MB graphics card with OpenGL acceleration and a monitor display of at least 1024-768.